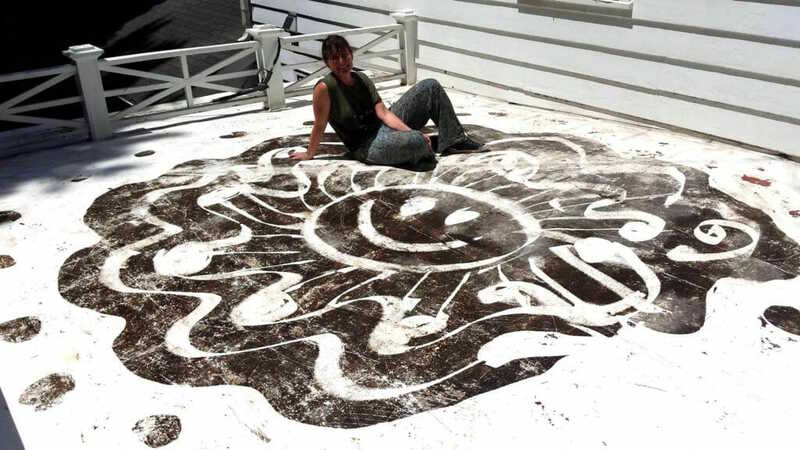 My dear friend Rebecca moved to Missouri last year, and in addition to her many family activities and house-renovation projects, she is exploring a new artistic realm. When she posted this image of her latest pressure-washer work in the porch-mildew medium, I was inspired to write a bit of ArtSpeak to help solidify this emerging genre. With her “Under Pressure” series, Rebecca Parks expands Outsider Art onto the virgin landscape of the rural deck, exploring the dialectic contrast between Relaxation Spaces and the technologically mediated high-velocity streams of water with which she creates thoughtful, mandala-like representations of family dynamics, overwhelming information, and transitory states. Often pausing in reflection, her own moisture merging with that of a yet-unfinished work, the artist steps into the canvas of macro and micro to remind us of scale, giving a high-five to the hyphae while drawing attention to the vast gulf between the ambient humidity in which mildew thrives and the explosive intensity of the blast that sweeps it away. Rebecca thus explores the very extremes of water, from passive to invasive, turning these into metaphors of each other and by extension, of information and power. The viewer becomes participant, invited to contemplate our own narrow range of survival and the transition from informational stasis to the overwhelming flood that destroys some and nourishes others, leaving an indelible yet transient meta-pattern on the landscape of our culture. In her representation of this, Parks has captured the diverse cultural overlay of the Internet, our own assimilation, and the struggle that belies the beguiling passivity of a rural porch bathed in the informationally rich vapors of WiFi.